I have wanted to shoot a lunar eclipse since I failed in 2007. And a blood moon?! Cool! Furthermore, I've wanted to shoot a Super Moon for a long time. The first time I'd heard about them was on Cinco de Mayo, 2012. Family was in from out of town, and I figured I'd impress them by towing them an hour from home to shoot photos of the super moon from a remote spot in the Texas hills. 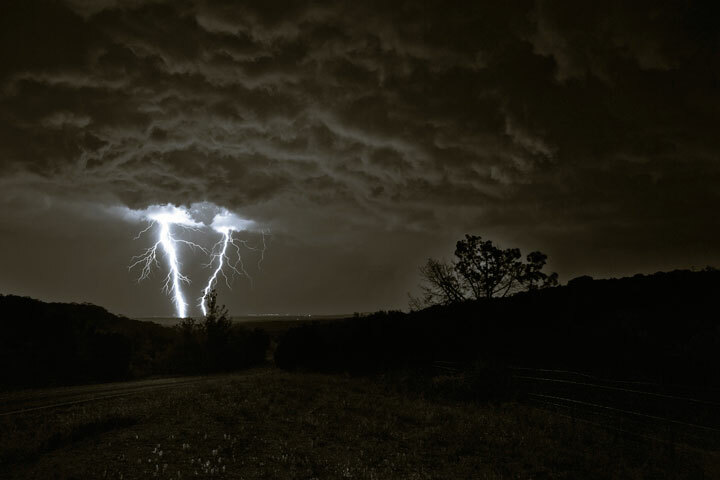 Buuuuutttt, it stormed so we couldn't see it, and I got this fantastic photo of lightning instead. So last night was not only a Supermoon, but a Blood Moon AND a total lunar eclipse! I have truly had a rough week with Narcolepsy threatening to keep me sleeping through each day, even with my normal medicine and stimulants, and my body pains have been worse than normal. I didn't think I had it in me to do a photo shoot, especially because I didn't know where I was going to go. However, a new friend in the area invited me to shoot on her property, and I took the opportunity, knowing it would be so much safer to be with other people. Often, shooting requires hours of being outside, so now I had help lifting my equipment and a chaperone in case I got too tired outside. Great plan! It was truly beautiful. 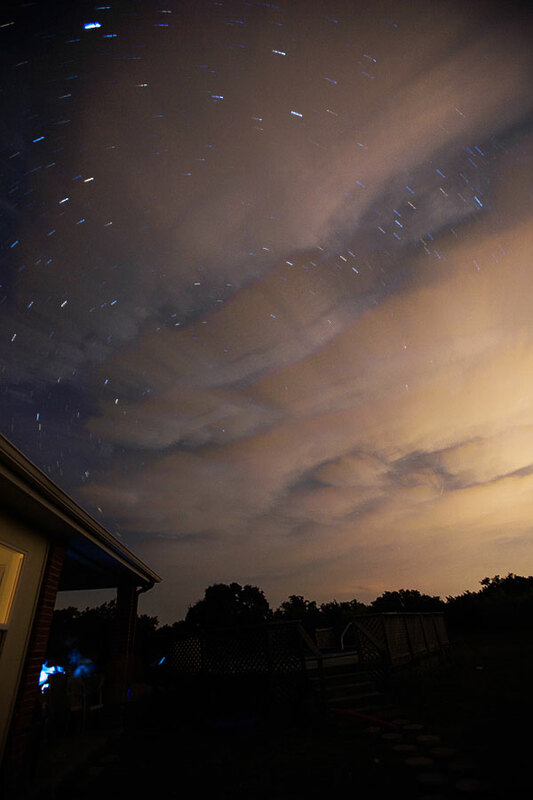 At this point, my friends were disappointed that the moon was eclipsing but blurred behind the cloud cover, until I stepped out from the patio and looked up to see how gorgeous the rest of the sky was, which for me was just as powerful. 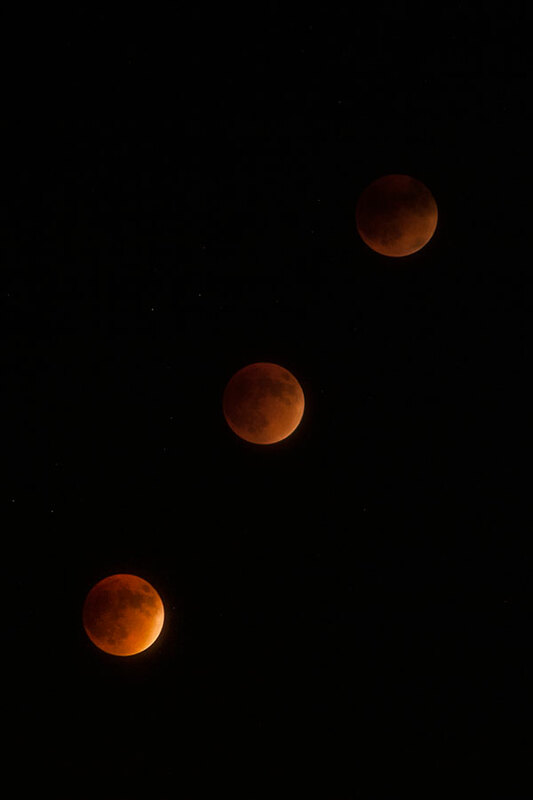 Then, between the times of 9:47 CST which was supposed to be the peak of the Blood Moon, and 10:something, I captured the following succession of shots with my 70-200mm lens. Blood Moon Supermoon Lunar Eclipse: succession of 3 shots as the red-tinted moon rose in the air. September 27, 2015. After this, I decided to go back to shooting with a wider angle lens to capture the whole scene. Because the moon can not be as prevalent in the shot in a wide angle, I wanted to send a message to those who had not be able to watch this amazing moment in history. 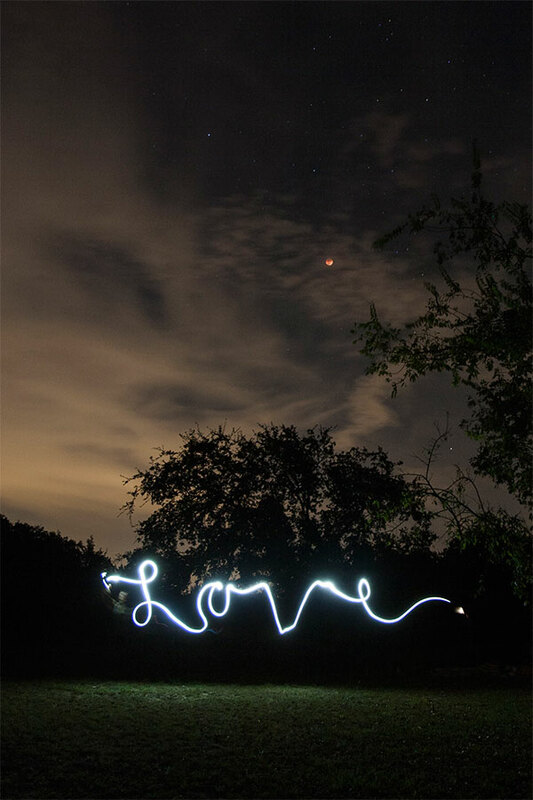 I decided to write these messages with the flashlight from my phone while the shutter was open, just long enough to capture the scene, the red color of the moon above and the words I was writing in the air. Miabella, not shown because she is moving quickly enough to not be detected, is using her phone's flashlight to write the word "Love" in cursive in the air under the trees and the blood moon. 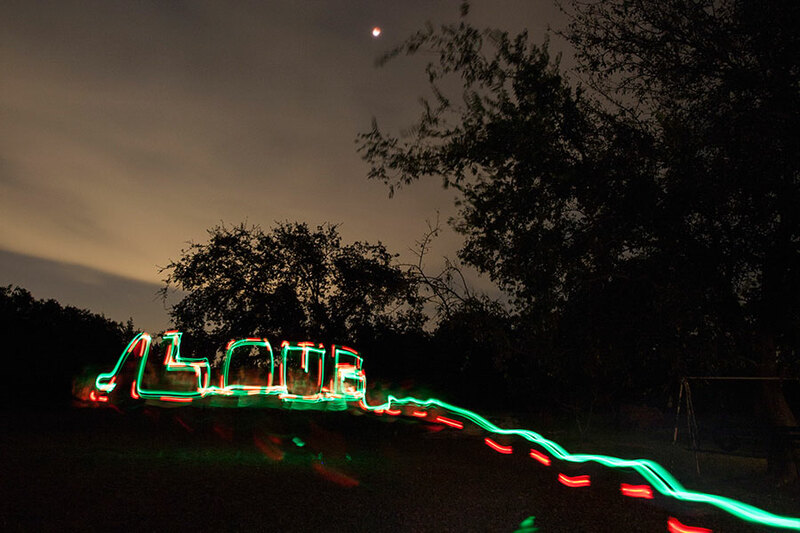 The camera's shutter was set to stay open long enough to capture the entire word, and it's subdued light reflection in the grass below. Then I tried the same thing using a green glow stick and a red flashing light. I wanted to go for more of a graffiti look, and this is the first time I've ever tried creating block letters, painting with light. Super fun! For awhile, I totally forgot my body was in complete pain. This is why I love creating so much. And lastly, one of my favorite words, something that I think we only feel when we realize it is our birthright to feel however we want. Well, bliss is the ultimate for me. To me, it feels like the radiant combination of being in love, and filled with joy and peace, all at the same time, like you're simply glowing from within with the purest, warmest light. Oh, yes. Thank you for checking these out, and as always, shine on my friends!